DME Flow Regulators monitor and regulate the flow through the mould. 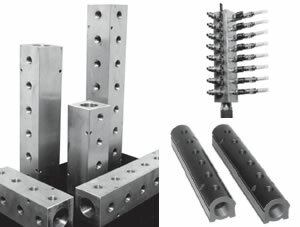 Manifold blocks made from tough glass-filled nylon construction. 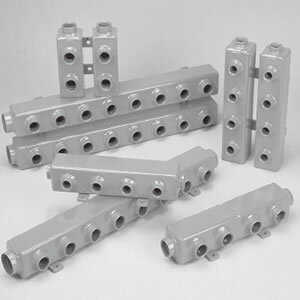 Our aluminium manifolds offer many advantages over welded steel or pipe manifolds. These manifolds have no welds or seams of any kind and cannot rust, they will offer many years of trouble-free service. The heavy wall extrusion will withstand extreme abuse and the round center hole permits easy cleaning. We will custom make manifolds to your dimensions in just a few days. Compare the features and price to anything else and you’ll under stand why our man i folds are the new standard for moulders from Coast-to-Coast! SMARTFLOW® DUOFLOW™ Manifolds are robust extruded aluminium manifolds similar to the original Smartflow one-piece design. The manifolds are divided internally and anodized with one red end and one blue end to denote supply and return on a single manifold. Our painted steel water manifolds help you increase cycles through more efficient water distribution. They help you tidy your hoses while reducing the number of hoses to mould. 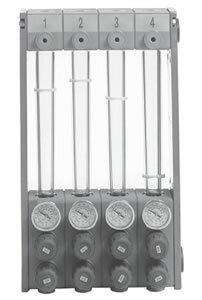 Mount the manifolds close to your mould for maximum flow volumes. Platen-mounted manifolds reduce hose lengths (if you plan to keep platen-mounted manifolds in storage with your mould, we recommend that you select our anodized aluminium or stainless steel manifolds. All the benefits of our painted steel manifolds: better water distribution for increased cycles, reduced number of hoses, tidier hose arrangements…and a big PLUS: NO RUST OR CORROSION. If your plant has poor water quality, the extra investment in stainless steel pays off fast in lower maintenance and maximum flow volumes at all times. If you platen-mount the manifolds, you can put them into storage with no fear or rust.